Kathryn Aurora Gray, aged 10, discovered a magnitude 17 supernova on New Year's Eve, in the constellation of Camelopardalis. 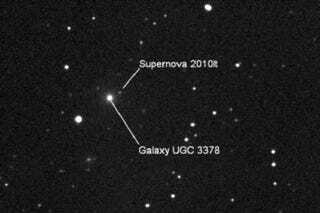 Gray had learned a 14-year-old was the youngest to find a supernova and felt sure she could beat that. Gray's discovery, which was soon confirmed and announced by the International Astronomical Union, came as a result looking through 52 images on a computer screen, from amateur astronomer Dave Lane, who had emailed the images to her father. Gray's father helped her check the discovery by helping her run through the list of current known supernovas and rule out asteroids. It's fantastic that someone so young would be passionate about astronomy. What an incredible discovery. We're all very excited.